We’re glad you’re considering hiring Noteworthy! We’re no stranger to weddings, private parties, tailgates or any kind of event. There’s a lot of information on this page but to skip down to brass tacks, contact our Business Manager for all booking matters. Location: In general, unless you catch us on tour, we can usually only manage a gig in the greater bay area. Anything further away than that, we may have to ask for help with additional travel costs. Times: As college students, the best time to get us is the weekends but we’ve been known to do gigs during the middle of the week; we can usually wrangle it unless there’s too many midterms that week. The other major problem arises during the Summer when we are normally dormant. Occasionally things can work, though, so don’t let that stop you from asking. Mood: While it may appear to an outsider that all we do are silly goofy songs, we do have much more than just that. In addition to our most public “Goofball” sort of shows we can also do more somber sets, sets of love songs and “Ra-Ra, Go Cal” performances. Thank YOU guys for making the night so wonderful. Your professionalism, charisma, great personalities, and fantastic performance made it a true pleasure to work with you all. Everyone in the crowd loved you, and I hope to have the pleasure of working with you boys again! Repertoire: We’re really sorry, but we can’t accommodate requests for specific songs that are not on the list of original pieces or covers on the website. One of our arrangements takes one of our members a long time to write and it takes the entire group even longer to perfect. If you give us enough notice, we might be able to work something out but we also have to be sensitive to the campus tradition of not repeating songs done by another group on campus. If you do request a song and we happen to know of a group on campus that does it, we’ll be more than happy to connect you with them. 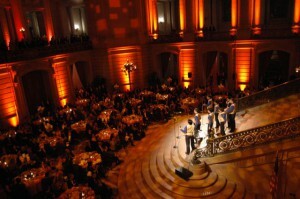 Your first step will be to e-mail the business manager at noteworthy [AT] ucchoral.berkeley.edu. Please be sure to let him know where, when, how long and what sort of songs you’d like so that he can get a quote to you as soon as possible. If you’re on campus, organizing a charity event, we always and happily perform at such things for free. Furthermore, if you’re trying to get Cal students riled up for something like a game or trying to get people who aren’t yet cal students to come here, we also happily do these for free.